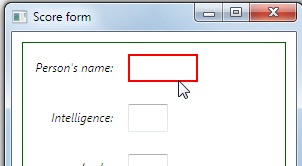 Open the window in the above folder, and make it the default one for your application. Add a property trigger to the style which targets textboxes, such that when the IsMouseOver property of any textbox becomes True, the BorderBrush becomes Red and the BorderThickness property changes to 2. A deliberately tantalising and incomplete hint to get you started! When you mouse over any textbox, it gets a thick red border. Check your application works, then close the window down.